About a year ago, before my second daughter was born, my wife and I decided to take our one year old daughter, Lila, on a hike. There was a Wildlife Management Area that I had been wanting to scout so we decided to go there. 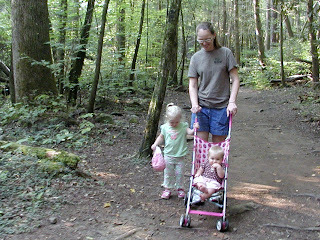 Before our daughter was born we were big Geocachers and hikers. Unfortunately, we had done little of either after she was born. We were excited about the opportunity. We arrived at the WMA, strapped Lila into a backpack carrier, and began a pleasant hike. The first two miles of the hike was on a dirt road that bordered a soybean field. As we approached the middle of the field I saw two round black ears pop up out of the soybeans about 60 yards away. I instantly got excited and took a couple steps closer, trying to see it better. The ears were unmistakable; it was a beautiful black bear! As the bear stuck its head out of the soybeans to check us out, my wife started to go into hysterics. She told me we had better get out of here. That was a BEAR and it was going to eat us. The bear was showing no signs of aggression, in fact it was slowly walking away from us. It was neither alarmed nor upset. I told my wife to stay put. She instead did one of the worst things you can do around a bear. She ran away, stopping about 100 yards behind me and my daughter. I stayed put until the bear turned its back on us and began slowly moving away. It was one of the most beautiful things I had ever seen. I'm talking National Geographic picture perfect! After the bear was gone I continued down the road calling my wife back. She refused, so we turned around and headed home. My wife and I were talking about this the other day. She says that the hike back to the car was the low point of our marriage. She was out-of-control mad at me. How could I bring our baby to someplace this dangerous? Lila could sense the mood and was uncomfortable in the backpack so I let her out to walk. She headed directly to a patch of poison ivy, which also contained a snake. It was hot and she was thirsty, but there was no comfortable place for a bottle. It was a disaster. What could have been one of our best outdoor memories had turned into the absolute worst. 1. Keep your outings short. The hike I described above was way too long. We were planning on a five mile hike. Craziness! A toddler does not have an attention span. They also do not have the physical capability to hike, boat, or even sit all day. Every family is different, but I find that it is best to keep outings to less than an hour and hikes to less than half a mile. My two year old can enjoy a half mile hike, but much more than that and she gets whiney. A simple, but enjoyable short outing is much better than an exciting outing with a fussy toddler. 2. Educate everyone on how to deal with wildlife and other dangers. Before I started the "bear hike" I should have informed my wife that we may encounter bear or other wildlife and instructed her on how to deal with potential encounters. While my curiosity in the bear may not have been prudent, her running away put us in real danger. Teach your toddler from a very early age about animals. 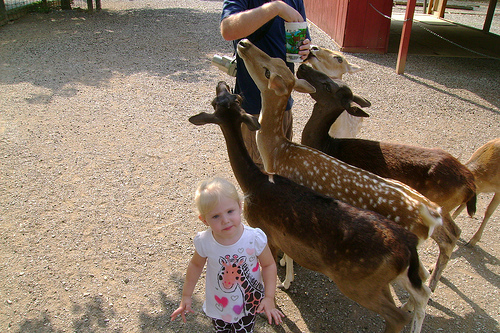 Bring them to the zoo, have them pet the animals, and teach them about animals they need to avoid. Every time I see a snake on TV or in the zoo I say to my daughters "When you see a snake outside you leave it alone and go tell Daddy." Now when we see a snake my daughter says "leave alone!" She also knows to stay away from water, and believe it or not, she listens! 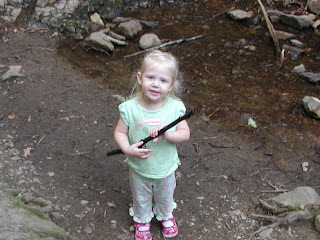 A few weeks ago we went hiking in the smoky mountains. It was a wonderful experience. We were letting Lila run a little ahead, she likes to "run fast", and we would call for her to stop when she got out too far. She was doing a great job of obeying. As she was running a giant tom turkey stepped out in front of her. She could have tackled it! Without my prompting she did exactly what she was supposed to do, she stopped and slowly walked back to me. Telling me that she saw a "daadoo", her word for turkey (it’s the closest she can come to a gobble). She is only two and a half, but I trust her, within reason, with wildlife. 3. 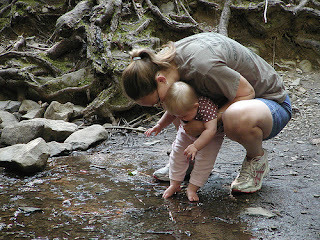 Look for family friendly hikes. 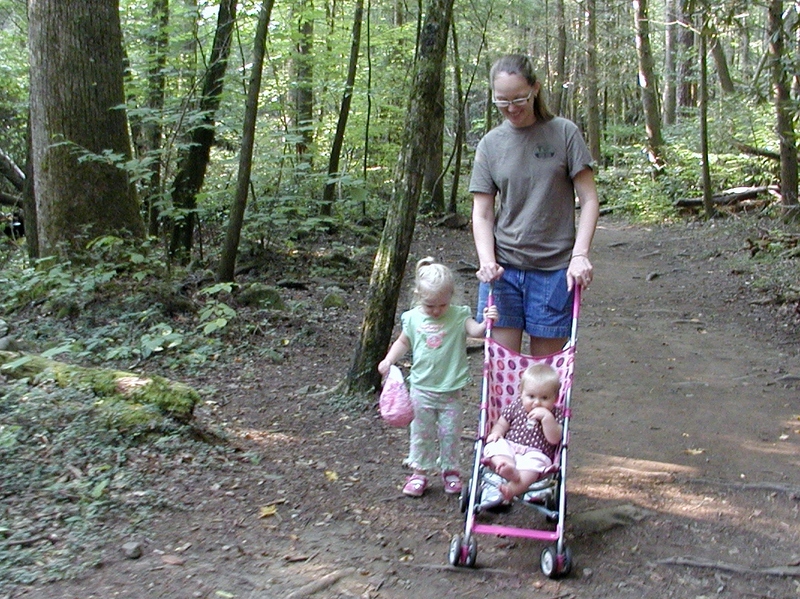 Most national, state, and local parks have family friendly trails. These are often short, easy, and have plenty of resting places. Some are easy enough to use a stroller on. You may be thinking that’s not real hiking! You're right, it’s not. When you spend time outdoors with your toddler your focus should be spending time with your toddler! Deal with the boring hikes now and in ten years you will be hiking up a mountain with your family. Try to drag a toddler up a mountain and they will learn to hate the outdoors. And by all means, don't take your toddler scouting! 4. Bring plenty of snacks and drinks. Toddlers are fuel burning machines. A hungry toddler is an unhappy toddler. Bring plenty of extra drinks. The very last thing you want to do is have an empty sippy cup half way through your hike. It can actually be dangerous. Toddlers can't tell you when they are feeling dehydrated. In an effort to keep up with Mommy and Daddy they can really over heat and overdo it. 5. Know when to go home. Leave before things go south. A short happy memory is better than a long memory with an unhappy ending. Every family is different. Only you know the point when it is time the pack up and go home. I am doing everything in my power to teach my children about the outdoors. They are learning gun safety. When I am successful hunting I show them my kill (sparing them any gruesome ones). We talk about animals often, read books about the outdoors, and watch outdoor TV shows. My daughters love my outdoor magazines and they "read" them more than I do. I am looking forward to when we can go on long hikes, catch some fish, or stalk squirrels together, but until then I am content with tamer, toddler friendly activities.